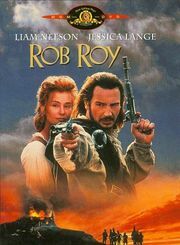 "In the highlands of Scotland in the 1700s, Rob Roy tries to lead his small town to a better future, by borrowing money from the local nobility to buy cattle to herd to market. When the money is stolen, Rob is forced into a Robin Hood lifestyle to defend his family and honor." Set in Scotland the land of my ancestors. The casting was great. I love Liam Neeson and Tim Roth. Jessica Lange is alright too. Along with this, the acting was pretty good. A couple times it seemed cheesy and over-dramatized. The costumes were lovely and very authentic. Kuddos to the costume director! The editing was well done. Example, I especially loved the part with McDonald running/riding through the woods while some lass was singing a heartbreaking song. Like earlier stated, there were a few bits that were overly cheesy and over-dramatized. Don't know why, but Jessica Lange bothers me. The last fight was awesome, but for some reason it bugged me. This point is hard to explain, but yeaaah. Overall this was a pretty good movie. The setting was lovely (it's set in Scotland for heaven's sake!) and the costumes were AMAZING! I felt like I was watching real events. As if someone went back in time and recorded these events. Though some of the acting was over-the-top, I highly was entertained. I would recommend this to those that love history, Scottish history, Scotland in general, a nice action movie, or for those looking for a good movie. This movie was a little hard to stamp a star rating. Mhmmmmmm, I think I shall give this a three.